Ah, alas the most wonderful time of the year is here, with tinkling bells, smells of sweet spices and boozy glasses, Of roasts and toasts and chimes and carols. Makes me wonder why it cant be Christmas all year round. Many years ago as my husband and I were walking down a sleepy little street in Scotland we spotted an adorable little shop called 'All things Christmas' and on its show window it they even had a small card counting down the days to Christmas. My husband wouldn't stop teasing me about the owner having some karmic connection with me and happily announced that my Christmas obsession had finally met its match. As I've repeatedly mentioned before my school's the one to blame for this one. Christmas time at our convent based school was no less than a month long celebration with all possible bells and whistles thrown in. 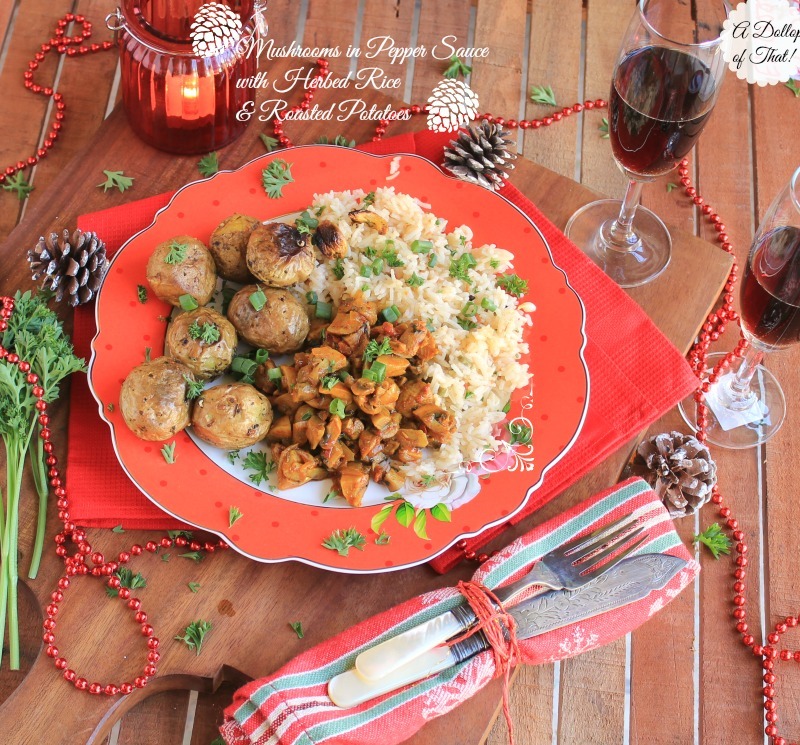 I've always associated Christmas food with sweet treats and quite a few of these sweet recipes are up on this blog too!, but call it age or a change in palette, my tastes are slowly gravitating towards savoury food and the last couple of posts here on ADOT! bear witness to the same. Now festival time means time for some good ole bloggers collaborations and writing blog posts with fixed timelines, sharing pics and links and all the jazz is a whole new level of excitement for me. Much like Christmas morning when three of my friends and I would customarily collect at my grandmothers home and share our previous nights gifts that Santa Claus had discreetly left when all of us were fast asleep. Oh what joy!, unmatched and unparalleled to date. Savory Christmas food be it lunch or dinner always has some kind of roasted meat associated to it, Christmas Ham being on top of everyone's list followed by roast chicken, game birds and of late turkey, but making something that is not very popular and still goes with a Christmas theme was very exciting to execute. 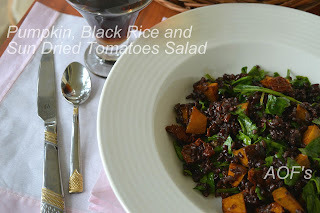 The idea was simple to have a roasted element, some European styled rice and one more element, but what? A trip to our local vegetable market came to my rescue rather quickly and both baby potatoes and fresh white button mushrooms were looking at me all wide eyed and cute cheeked so I couldn't help but get them home. Thankfully my experiment worked and thus were born these three dishes in a platter, They're all relatively easy to execute (albeit a mouthful to announce to your guests) and delicious to boot. 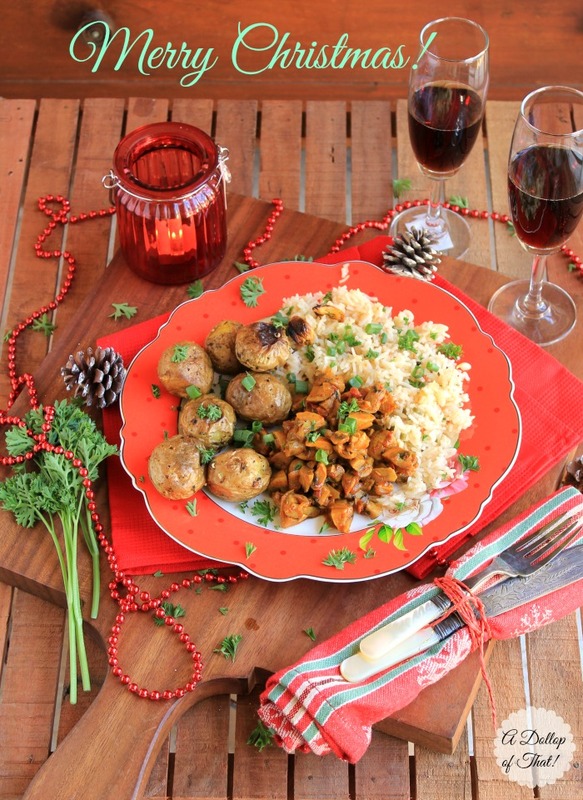 Serve for brunch, lunch or dinner this platter wont disappoint. Freshly chopped parsley to garnish. Wash mushrooms well in running water and scrape off all the dust particles and black dots on it, chop into smaller cubes and set aside. Now take a pan and place on flame. Add oil and after it heats up add chopped onions with a little salt and saute well until they turn translucent. Next add the tomato paste with 1/2 cup a of water and mix well. Now add in the crushed black pepper and cook on a low flame until the the tomato paste is cooked well. Cook on a medium flame. The mushrooms will let out their water, so do not add water now. Finish off by adding some some chopped parsley. 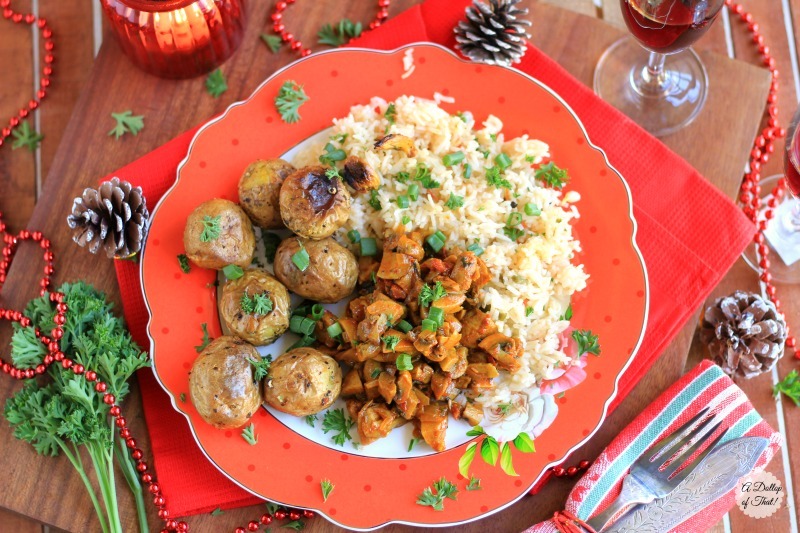 Place all the ingredients except potatoes into a large zip lock bag and toss to mix. 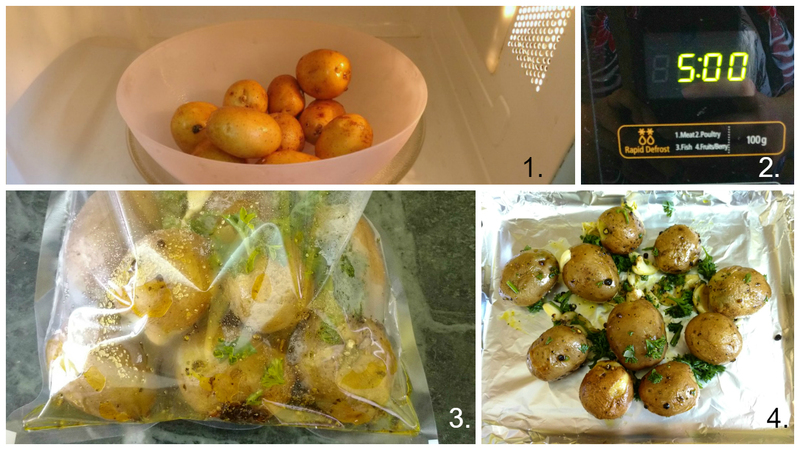 Wash and clean each potato thoroughly and place them on a microwave safe plate and microwave for 5 minutes. Once the potatoes come out of the microwave place them in the zip lock bag with the mix herbs and garlic mixture and let stand for 10 minutes so that the warm potatoes can absorb all the flavor of the garlic, mixed herbs and mustard oil. Roast potatoes for 30 minutes or until crispy golden brown, turning them once after 15 minutes so that both sides get crispy golden brown. These babies are ready to Serve. In a medium saucepan, heat the oil and add the onions, cover and cook over low heat until translucent. Next add in the diced tomato and cook for 1 min more. Now, stir in the rice and garlic. Add the water and stock cubes with 1 teaspoon of salt and bring to a boil over high heat. Cover and cook over moderately low heat for 10 minutes. 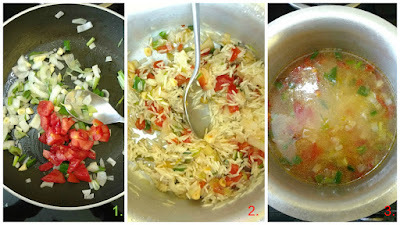 Replace the lid on the rice with a clean kitchen towel and remove from the heat. Let the rice stand, covered, for 5 minutes until tender. Using 2 forks, lightly fluff the rice. Gently stir in the herbs, season with salt, cover with the towel and the lid and let stand for up to 30 minutes before serving. Hey we aren't done yet!, go checkout Sweta's perfect side of Pumpkin, Black Rice and Sun Dried Tomatoes Salad at her blog Oriya Rasoi. 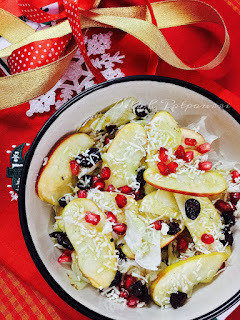 and also Saswati's christmassy Holiday Salad with a Honey Apple Cider Vinaigrette at her blog Delish Potpourri.